"The Street We Grew Up On" is the theme of this candid, casual, fun wedding photo. Here the bride with her lifelong friends...her best girlfriends...are seen walking together down the street in front of the bride’s house. In a few short moments the girls will be getting into their limousines for a short trip to the church where the couple’s wedding ceremony will be held. The bride will be escorted up the aisle of church on her father’s arm and the groom will get his first look at his beautiful bride in her wedding gown. After the ceremony the entire bridal party (bride, groom, maid of honor, best man, bride’s maids, groomsmen, ushers, flower girl and ring bearer will take off for nearby Cedar Beach in MT. 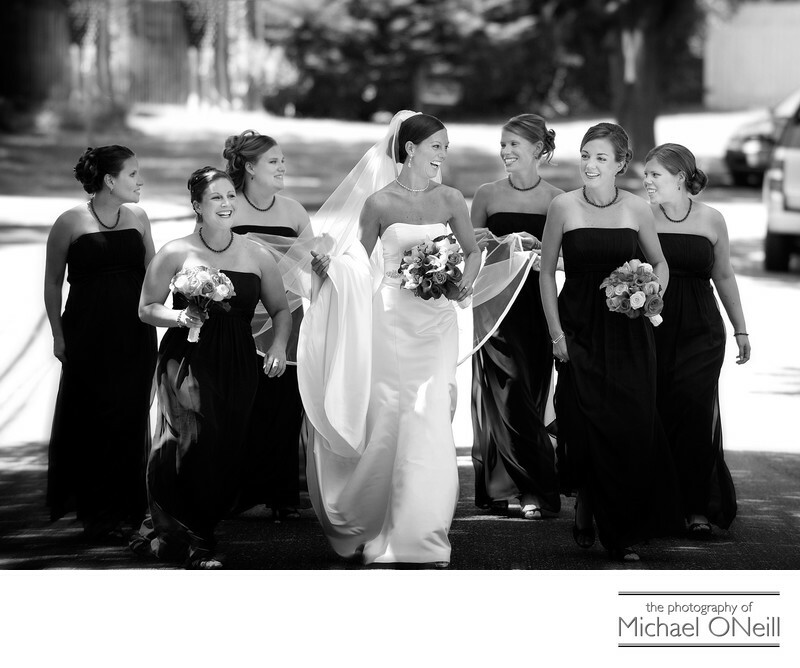 Sinai, New York for some really fun, candid, playful wedding photographs. They will then meet all of their wedding guests at their reception venue, The Hamlet Willow Creek (part of the Club Corp group which also includes The Hamlet Windwatch in Hauppauge and The Hamlet Golf and Country Club In Commack, NY.